Brightmyfuture is an editing and proofreading service. This means that their range of services is limited solely to improving written papers. The company does not write papers from scratch. For the services they offer, they promise the lowest prices which, according to customers, isn’t really the case.A professional-looking site filled with information about the company and their employees is sufficient to attract the attention of students who seek academic help. Those who need help with the papers they’ve written remain on the page, while the rest leaves it. Let’s see what kind of editing and proofreading service you can get at brightmyfuture.com. Despite the easy navigation and beautiful design of the website, information regarding prices is non-existent. The only way to get this information is if you contact their agents. 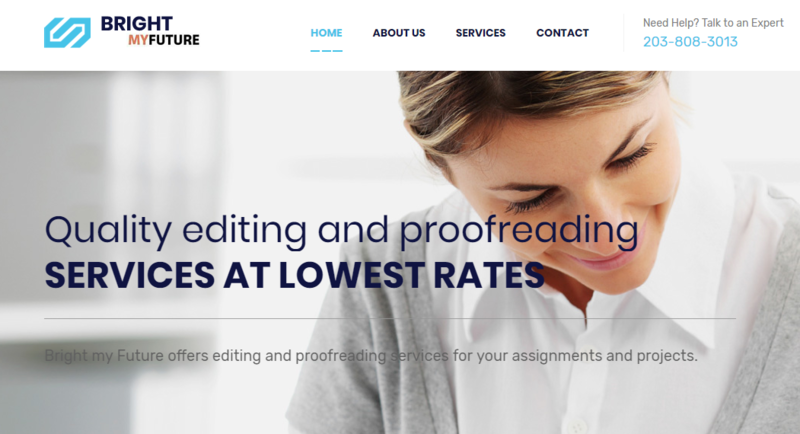 By providing all details regarding the paper you need edited or proofread, you can get a quote for the service provided by their editors.When we asked their agent how much an editing for an essay would cost if ordered within 7 days, he gave us a quote of $15.6 per 250 words. This is a price that would fit writing from scratch, but it’s definitely one too high for editing of finished papers. If the deadline was closer, this price would be a good fit. However, with a deadline of a week, this is one of the highest priced editing services on the writing market. There is not much to be said about the list of services. Their services are basically editing and proofreading. The company has further split the list into editing of dissertations, essays and assignments. When we asked about the limited list of papers they edit and proofread, the agent informed us that they accept many types of academic writing under assignment editing. Still, their online list is very concerning and there is no way to learn which papers are edited by Brightmyfuture.com and which not. As there are no prices, there are no discounts either. Free features are not applicable to editing and proofreading of existing papers since these papers should already have title page, references, etc. Asking about the discounts resulted badly since the agent was not informed on the discount policies of the company, so we had to wait for a while to once again, get an inconclusive answer.The bottom line is, there is no discount or code you can use to get a lower rate. The quote the agents will provide you with will be the quote you’ll have to pay. The customer support is available non-stop and even contacts the visitors upon opening the homepage. However, most of the answers they provided us with were vague and inconclusive, as if the company hasn’t decided what they offer just yet. Based on feedback online, Brightmyfuture.com doesn’t have many customers and as a result, feedback online is rather limited. The feedback you could find on the Web is split between negative and positive, so there is no way to know which will be your experience.Because of the unpopularity and very strange system, Brightmyfuture.com isn’t offering a lot to those who visit their well-designed site. No discounts and quotes upon requests can be frustrating for anyone, especially if the quotes they get are as high as the one we got.